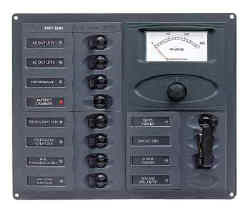 8 Way AC Control Panel with Analogue meter. Available in 110V 60Hz or 230V 50Hz. Buss Bars: Yes x 2 (Earth & Neutral). Includes lock out control and reverse polarity indicator. Circuit breaker ratings indicated are 230V and are adjusted if 110V is requested. All digital and analogue panels are supplied with transducers.